Buy Brother mfc j6710dw with CISS and make 30 times more quality prints for the same money! Pay only 0.04 USD for A-4 full color imprint! It's always pleasant if we see a product with an exclusive and stylish look, with multifunction abilities and which is able to answer all you demands, but for a rather reasonable price. The Brother Printer MFC-J6710DW belongs to All-in-One class (AIO) of inkjet printers. It has all functions to provide Printer productive and efficient operation, such as high performance, that is essential for large enterprises. This printer copes with printing and copying excellently and with a high quality. The printing and copying cost with this device is pretty low, as well as with its fellows in this class, such as Brother MFC-295CN, and Brother MFC-790CW. 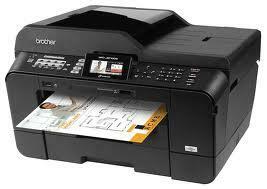 The Brother MFC-J6710DW Printer prints, scans and makes copies of ordinary and oversize documents (i.e. books, or 11x17). The availability of fax will be of use for small business. Its latter function is remarkable. Usually, the possibility of printing 11x17-inch documents features the devices of a different class. It will be better to mark exceedingly low cost of its consumable materials and as a result the lowest cost of one page. Brother Printer MFC-J6710DW was manufactured for printing, copying, scanning and sending faxes and for dealing with large documents up to A3 size. That is why it has rather large size, so it is not as compact as desired. In spite of the fact, that it was designed as a desktop version, the device will still be more than an average office desk. Further to the large size of its case, which is elaborated to cope with large sheets of paper, this printer has two input paper trays for 250 sheets at the front. At the back there is a manual sheet feeder. Its automatic document feeder (ADF) for 35 sheets is two times larger than an ordinary ADF. These particulars give a possibility of scanning and printing books of different formats avoiding placing them on the scanner one at a time. Under the flatbed scanner the control panel is located. It is also rather large and stretches over the whole width of the printer. Brother MFC-J6710DW wireless inkjet all-in-one Printer is a bit complicated. It has a lot of buttons and functions, but it is well balanced and handy in usage. The printer has 3.3-inch large LCD screen. For easy viewing of documents and images it could be inclined. Built-in USB port is situated under the control panel, also there are two slots for flash memory cards. Due to USB port you will be able to connect it and print documents directly from the most smart phones, USB flash drives, digital cameras and memory cards. The card reader copes with almost all flash formats and provides a lot of input and output parameters. This capacities were separately marked at the presentation of the printer in such cities New York, Washington, Boston, Detroit, Chicago . Many users had a possibility to get acquainted with its advantages and approved them. 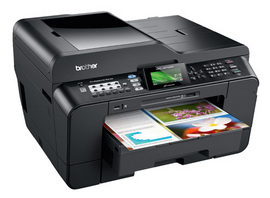 The Brother Printers MFC-J6710DW could be connected to the network due to Wi-Fi (wireless) and Ethernet. Also you can connect it directly to your computer via USB cable. These functions of wireless communication will allow you to use this device almost anywhere. You could easily move it around working area. You can also make prints without any connection even from mobile devices running on Apple and Android. This multifunctional device could work with smart phones and tablet computers via wireless network if you download some free applications from the Apple App Store or Android Market. Recommended Paper Brands	Brother Inkjet Plain Paper (BP60PL), Brother Ledger Plain Inkjet Paper (BPPLGR), Innobellaв„ў Ledger Glossy Paper (BP71GLGR), Innobellaв„ў Glossy 8.5" x 11" Photo Paper (BP71GLTR); Innobellaв„ў Glossy 4" x 6" Photo Paper (BP71GP20), and 3M 3410 Transparency Film. Sheet Weight - Paper Tray (max/min)	(Tray 1) 17-58 lbs. (Tray 2) 17-28 lbs. Sheet Weight - Manual Feed (max/min)	(Manual Feed Slot) 17-76 lbs. Max Input of ADF (Width/Height)	11.7" x 17"
Carton Dimensions (W"xD"xH")	25.8" x 23.5" x 17.3"
Carton Weight (lbs)	53.4 lbs. Unit Dimensions (W"xD"xH")	21.3" x 19.3" x 13.0"
Unit Weight (lbs)	40.1 lbs./18.2 kg.